Cole Hamels started the season as the team's 2nd starter despite everyone in the nation knowing that he is a much better pitcher than Brett Myers. Throughout the course of the season, Hamels was a rock, though. While amassing the second most innings pitched in the NL (behind Santana), Hamels was a strong "number 1" for the Phillies. He was snubbed from the All-Star game, and subsequently ignored in Cy Young voting, most likely due to his "poor" 14-10 record. I have gone off many times on why pitching "win/loss" might be the dumbest stat in major league baseball (followed closely by the save). One large thing that people miss when they push W/L to the forefront: Run Support. Of the 55 pitchers in the NL who accumulated more than 140 IP, Cole Hamels ranked 42nd in Run Support with 4.59 RPG. 1st? Kyle Kendrick with 6.82 (plays a large part into his 11-9!!! W/L this year with a 5.49 ERA). No pitcher should be faulted for his lack of ability to make his team score runs, or conversely acknowledged for having a good number of wins while pitching far below average. In the same category of pitchers who threw a minimum of 140 innings, Cole Hamels was able to control being: 1st in WHIP (this is huge people), 6th in ERA, 4th in K/BB, 17th in K/9 IP. These are all things that pitchers can control (for the most part, aside from umpires discretion, and fielders positioning). 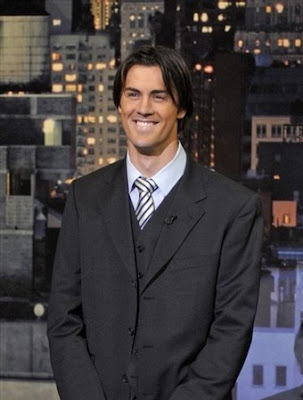 Cole Hamels is great pitcher. There is no question about it. One thing people might notice as shocking, is the fact that Hamels thrives when facing right handed batters as compared to left handed hitters. This is quite the abnormality when most pitchers do far better against batters of the like hand. This can be attributed to a few things. Cole's best pitch is his changeup. His change breaks down and to the left which means down and away from right handed hitters. This is a huge advantage against righties, and when it is thrown as well as it is by Cole, nearly unhittable. Pitcher's have to be careful when throwing this type of pitch to lefties due to the fact that the pitch breaks down and in to them, making it much easier to hit. As a result, Hamels has to rely on his oft-not overpowering fastball against lefties, and his less than steller curve. While he has been developing the curve lately, he needs to be able to better control it in order to have success against LHB. Side note, Mr. Musser said to me in passing with regards to Hamels's pitch effects to different handed hitters, "and if he's pitching in Hurricane Andrew, he's just throwing his fastball." We still like to complain about Selig's awful handling of game 5. Cole Hamels is 24 years old, and is becoming one of the best pitchers in MLB. The Phillies need to give him their bank account number if they want him to finish his career here. If Hamels hits the open market, there is very little chance they win a bidding war for him (aside from being cheap, the Phillies play in a hitter friendly park) especially after their money squabble over last off season. He pitched a lot of innings this year, and has been known to be injury prone in the past. Don't be surprised if he winds up in the DL next year. History shows that pitchers who throw many innings one year, tend to show the ill effects of it the following season. Not trying to rain on anyone's parade, but just a little heads up. While he did get snubbed from Cy Young votes, he was aknowledged as the MVP of both the NLCS and WS, which will most likely forever place him in the hearts of true Philadelphia sports fans.